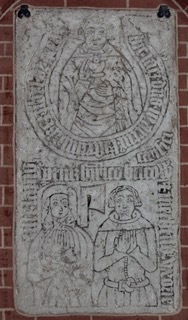 The former nunnery church of Holy Cross in Rostock, on the Baltic coast, contains an outstanding collection of incised slabs, all beautifully displayed and catalogued. (Wolfgang Eric Wagner, Die Grabplatten des Klosters »Zum Heiligen Kreuz« in Rostock, 2007) Many of the slabs represent nuns, sometimes two or three to a slab, as well as their chaplains, relations and benefactors. This one shows us a chaplain in Mass vestments, holding a chalice and host in his left hand, and blessing with his right, a characteristically German pose. The scroll around his half-effigy simply reads “Here lies Sir Martin Kistenmaker, Priest; pray for him”. Below are presumably his parents, father in civil dress, mother in a simple veil headdress, but between them is a butcher’s cleaver. The explanation is on their scroll, or rather by an inserted word above it: “this stone belongs to Heinric Bucow, \ butcher / and Mechtild his wife.” Different family names, in fact, but surely they must be related? Half-effigies are unusual in the Baltic, and virtually all known examples are in this one church. For this and other Baltic peculiarities, see my Bishops and Burgers, Dukes and Knights, available directly from www.lulu.com. The slab measures 1.44 x 0.76 m, and is number 21 in Wagner’s catalogue.